The Mile High City was an appropriate setting for the 2018 Precast/Prestressed Concrete Institute Convention: Members confirmed how market conditions and expectations are approaching new peaks, while leadership observed progress on five new fronts—national and chapter organization partnerships, market share tracking, national standards, workforce development, government affairs—aimed at ensuring PCI plant production rates outpace national construction levels. Reports leading up to the late-February Denver gathering indicated that producers in architectural or structural building components and systems, including parking structures, enjoyed the strongest year-over-year gains in 2017. Current plant backlogs and solid commercial project outlook suggest they will likewise lead the Institute this year. Bridge producers entered 2018 with an improving transportation market on the heels of two relatively flat years. 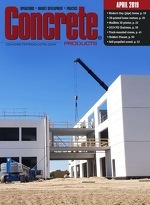 “The board determined that in order to accurately measure architectural and structural precast market share, we needed to make member reporting of sales breakdowns by building and transportation segment mandatory instead of voluntary,” adds Standard Concrete Products Inc. President and 2018 PCI Chairman Mason Lampton. “Producers have a confidential mechanism to report on precast/prestressed shipments to those segments; PCI staff never sees individual plant data, only the industry-wide figures. By interfacing our reporting with Dodge Data & Analytics and Portland Cement Association methods, we can accurately measure national and state market share for the first time. “Information down to square footage by building segment will drive how we apply marketing dollars and allocate Institute resources. We can show members progress in promotion and market development. If numbers indicate precast/prestressed production rates are increasing faster than the construction industry at large, we can reasonably assume PCI producers are gaining ground. Adding to the productive 2018 convention mood was members’ embrace of a change in PCI structure and mission initiated last year under Risser, who arrived at Chicago headquarters in 2015, and 2017 Chairman Dan Juntunen, president of Minnesota-based Wells Concrete. The PCI Board transitioned from legacy zone representation by producers to 10 chapters and two areas still without chapters. The new structure positions the national office as a technical and standards-developing authority to support chapters with design, engineering and best practices assets. It also respects chapters’ front-line exposure to established or prospective building and nonbuilding market segments. A plan draft was presented to the PCI board in Denver and a final version could be formally adopted during directors’ early-summer meeting. In addition to aligning staff commitments and resource allocation with the field organizations, the document prioritizes national standards, market growth, workforce development and government affairs activities. Standards. After a two-month comment period that concluded earlier this year, PCI is set to release its first national standard, Specification for Fire Resistance of Precast/Prestressed Concrete. PCI MNL 124-18, the first document the Institute prepared as an American National Standards Institute-accredited Standards Developer, updates 2011 design procedures and addresses two precast/prestressed concrete engineering approaches: “calculated” fire resistance, encompassing prescriptive provisions with tables for selecting concrete mass or protection of steel; and, “rational design,” a true fire resistance calculation procedure referenced in PCI manuals and the charter International Building Code (2000). PCI opened Specification for Fire Resistance of Precast/Prestressed Concrete to member, non-member and public comment and review per ANSI requirements. The PCI Fire Resistance and Standards Committees- and Technical Activities Council-approved MNL 124-18 will be eligible for reference in the 2021 International Building Code. Committees and staff have commenced the multi-year process for a second PCI national standard, covering glass fiber reinforced concrete, and will proceed with similar endeavors where ANSI-modeled documents can advance precast/prestressed concrete. Technical Activities Council members have identified 12 additional PCI standards to be produced over the next five years. Workforce development. Helping attract, train, and retain employees has been identified as a key value proposition for PCI members. The first program for plant employee training was rolled out at fall 2017 committee meetings and further detailed in Denver, where PCI Convention educational offerings included “Attracting and Training Tomorrow’s Workforce” and “Manufacturing Engagement: A Plan for Retaining Good Talent.” Convention attendees could also participate in workforce and leadership development plus plant operations sessions presented by the National Precast Concrete Association, with whom PCI has successfully teamed for The Precast Show, staged annually on late-winter windows and pacing attendance of 4,500. Government affairs. A group of officers, directors and member representatives will participate next month in PCI’s first official Washington, D.C. fly in, joining the National Ready Mixed Concrete Association, Portland Cement Association, NPCA and other allied groups for 1.5 days of Capitol Hill meetings. “We are educating our members on how to participate in federal government matters and encouraging them to tell their representatives the story behind precast/prestressed plants, products and markets,” Lampton observes. “We need members weighing in on issues of industry benefit and concern.” To the latter, he adds, PCI is among a group of downstream users formally opposing tariffs President Donald Trump applied to certain steel imports. Among PCI membership, Standard Concrete Products anchored one of the most impactful government affairs exercises in recent years—garnering praise from the Georgia Department of Transportation, Federal Highway Administration staff and Transportation Secretary Elaine Chao. Built primarily with components from Gate Precast’s Kissimmee, Fla., plant, the Phillip and Patricia Frost Museum of Science in Miami took the Best Government and Public Building category in the PCI 2018 Design Awards and the competition’s top honor, the Harry H. Edwards Industry Advancement Award. Founded in 1954, PCI is the leading developer of standards and methods for designing, fabricating, and constructing precast concrete structures and systems. PCI membership spans producers, precast concrete system erectors, architects, consultants, contractors, developers, educators, engineers, materials suppliers, service providers, and students. The Institute maintains a staff of technical and marketing professionals to foster greater understanding and use of precast/prestressed concrete. It also operates the world’s leading certification program for plants, precast concrete system erectors, and individuals in the precast concrete business, and more recently attained American National Standards Institute-accredited Standards Developer status. PCI publishes an array of technical manuals, documents, plus the technical and design periodicals, PCI Journal, Ascent and Aspire. Additionally, it conducts research & development projects and conferences, along with building and transportation Design Awards programs. The Institute headquarters is at 200 W. Adams St., Suite 2100, Chicago, IL 60606; 312/786-0300; [email protected]; www.pci.org. Standard Concrete Products, Inc. Wells Concrete Prestressed Casting Co.
Standard Concrete Products produces girders, beams, slabs and piles for transportation and marine construction markets from Atlanta and Savannah, Ga., and Tampa, Fla., plants. Deep water port proximity enables the latter two facilities to ship product to North and South American coastal sites, although much SCP output is geared to department of transportation work in the Carolinas, Florida, Georgia and Tennessee. Based in Columbus, Ga., SCP is a successor business of the Hardaway Contracting Co., founded in the 1890s by B.H. Hardaway Sr., and one of Florida’s early players in precast/prestressed concrete. B.H. Hardaway III’s son-in-law, Mason H. Lampton, acquired the Hardaway Company’s Tampa Prestress Division in 1997 and integrated it with Savannah and Atlanta yards to create one of the Southeast’s largest concrete bridge and pile product operators.